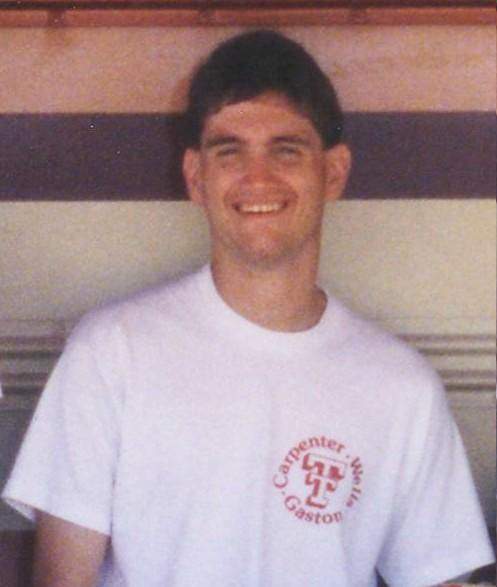 Timothy B. Mitchell, 29, Gladstone Missouri, died October 6, 1998, at his home. Tim was a radio enthusiast, member of Armadillo (Texas) and The Sunflower Interlink (Kansas). Originally from Plano Texas, Tim graduated from Texas Tech University, Lubbock Texas in 1991 with a BS in Electrical Engineering. He then went to work for Owens-Corning in Kansas City Missouri, specializing in industrial and automation controls. Always feeling the itch for working with RF, at the time of his death he was employed by Sprint PCS in Kansas City as an RF Engineer. Tim leaves a radio legacy: the 145.11 MHz repeater in Fort Worth Texas (now K5FTW), the 443.15 MHz repeater also in Fort Worth (now N5PMB), the 443.65 repeater in Kansas City Missouri (now KØSUN) and the 443.95 MHz repeater in Memphis Tennessee (now N4NBC). 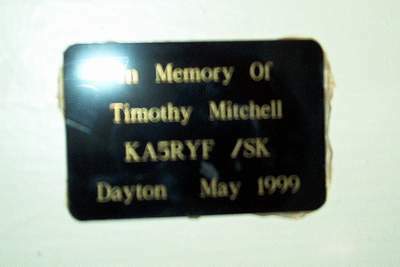 In memory of Tim, in May of 1999 a special plaque was placed at Hara Arena in Dayton Ohio where the annual Dayton Hamvention occurs (an event he always enjoyed attending) - on the aisle that marks his old 2 meter frequency, "11".